Have you ever wanted to become a minimalist? I’m trying to become one but allowing myself to keep some collections. Let me show you how. Have you ever wanted to become a minimalist? To me the word minimalist always conjured up images of cold and not cozy spaces with sparse home decor items which is not the look I like. 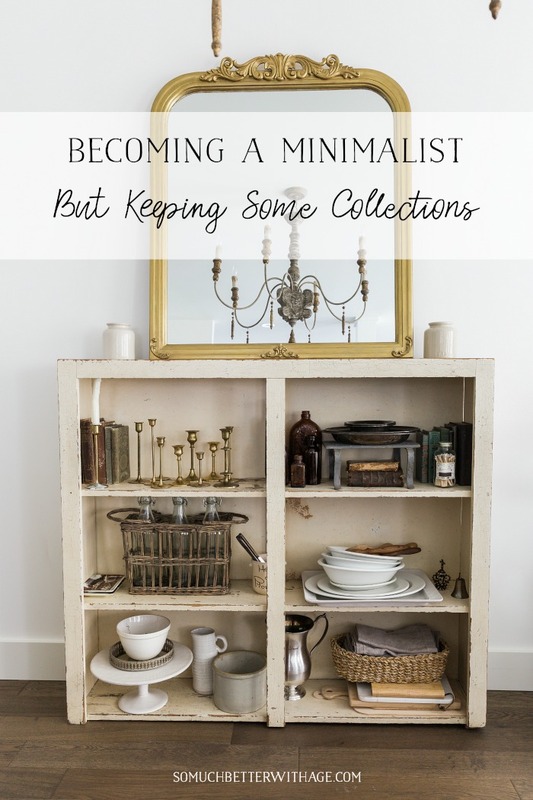 But lately I’ve been gravitating to the idea of becoming a minimalist as I’m tired of living with too much stuff. Since last summer I’ve been purging and decluttering my home. 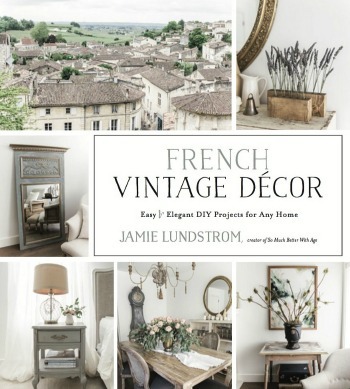 I had a house full of projects for my French Vintage Decor book and our plan was to move last year so I was hanging on to furniture for the new house. The market wasn’t the greatest time to sell last year and I’m not sure when we are going to look again but I’d rather get rid of stuff now. There is so much research these days on how a tidy space can lead to more creativity and less depression and anxiety. A cluttered house has also been I know I operate better in a tidy space! I’m a big fan of Marie Kondo’s The Life-Changing Magic of Tidying Up book and her new Netflix show is amazing to see how she puts her skills into action in other people’s homes. For me, the biggest problem is purging and decluttering has been my collections. I don’t have a lot but the stuff I do have I don’t want to part with. 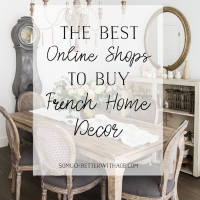 I have a small collection of ironstone, brass candlestick holders, vintage books and other items that have sentimental meaning (such as items I brought back from France). Instead of displaying these items all around the house, I’ve grouped them in this small bookshelf in my dining room. I’m sure you’ve seen it many times in my dining room photos. This bookshelf was left in the basement of this house when I bought it and it was holding junk and we almost threw it out but on further inspection, I realized that the color was great and the cracks in the paint is just the thing I love and so I just wiped it down and brought it in the dining room. 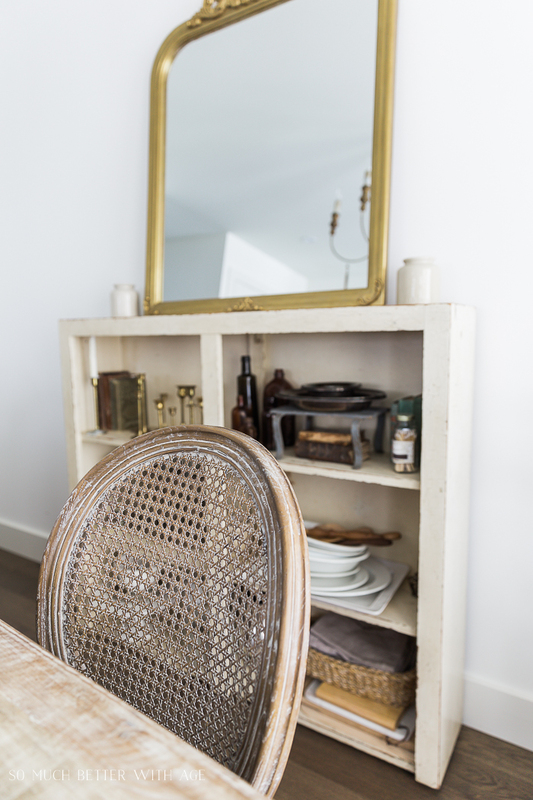 There is not a lot of space in the dining room for a large cabinet or sideboard so this bookshelf was the perfect thing to hold some items. It was intended as a temporary solution but it’s definitely here to stay. I reorganized the bookshelf by taking all of the items out and grouping like items together. Then I made sure to only keep what I trying loved and what ‘sparked joy’ as Marie would say. I put back the items in their groups (ironstone altogether, brass candlestick holders, cheese and bread boards). My collection is sentimental but most of the items are are also practical. The ironstone and large platter are items I use when entertaining as well as the linen napkins I made years ago and the boards for small charcuterie boards. And as you recently found out, I keep my china collection in this other small cabinet in the living room with my exercise gear. I love displaying unique pitchers and crocks to use as vases as well as serving beverages from. Multi-use items that are pretty are the best items to have for a collection! Let me know what you think in the comments below! Do you want to become a minimalist? Do you like the idea of minimalism but still want to keep your home cozy while keeping some collections? I’m interested to know what you think! 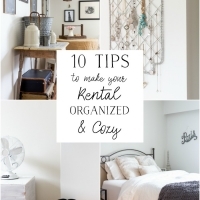 We can purge and declutter together while keeping our homes pretty and not stark. I think keeping what you love is definitely the key to this solution. Often I hold on to things because I might use them one day…but if that day never comes then why do I continue to hang on to it? What I am realizing is that day never comes because I like other things better and so I choose to use other things. I should be ok with that, knowing if I donate what I don’t use, someone else might love it. 🙂 I also love items that have multi-purpose. Items are always more justifiable if that is the case. This week, I was choosing between a new pillow cover in red or white. Both said the word “love” in gold and I realized while the red one would be cute to set in my occasional chair for Valentines Day, it would serve no other purpose. If I bought it in white, I can set it out in February and then move it to the bedroom other times. So, I bought the white one! The other thought I had is about your groupings. 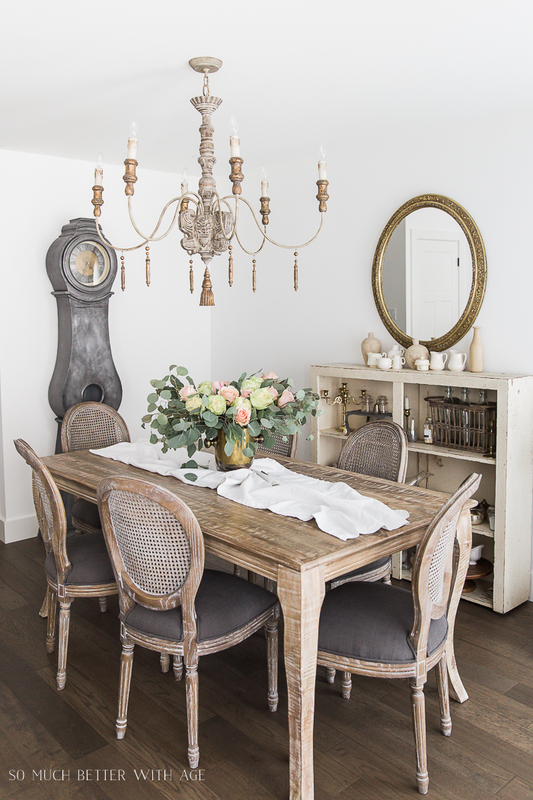 Items make a bigger statement when grouped together! 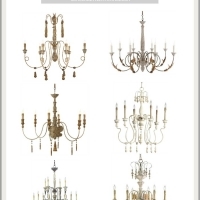 The brass candle sticks, for example, if placed around your home might go unnoticed when not being used. But together on that shelf, they make an impact! I feel the same way, Shannon. I’m hanging on to stuff for a ‘someday’ that never comes! And then I think if I’m saving too much stuff for my kids that it will just become a burden to them. So I’m only saving a bin of sentimental items. And I agree, if you can use it more than one time or way, it’s so much better. I love the items I keep on the bookshelf for that very reason. They look pretty but they are practical too. I’ve never had clutter but would not consider myself a minimalist. Even so, I have been working towards having less “Stuff” for about four years. Every new year, I go through and give away or donate pieces I no longer love or find useful. Some years I can not part with something but can the next year. It is a process. I don’t want a bare, minimalist home but I do want fewer decor items. Sometimes clutter is well hidden from the public but you know it’s there. I’ve gone through all my cupboards, drawers and closets too. Now they can breathe. I agree, it’s definitely a process! And you’re right, sometimes it’s not the right time to get rid of something but when you feel like you can, then just get rid of it. When the closets and drawers are all organized and decluttered, that’s when I can breathe too! Even just paring down a little bit feels so good, doesn’t it, Diana? I think this “minimalism” trend/craze has many of us caught in the middle. De-cluttering is one thing, conducting a 3-day massive “throw out” is quite another. In an effort to jump on the minimalism train, I believe many people might be acting on impulse and live to regret it. I could go through my home this evening and fill 3 large baskets with stuff that needs to be tossed now. I put that under the heading of de-cluttering. Considering a lifestyle change, (minimalism is a lifestyle) should be slow, deliberate, gradual removal of things (clothes, books, collectibles). Place the items that we can’t make an immediate decision about in a contained, out of sight area with the promise that we will review them again in 30-60 days. Within a month or so review, there will be plenty of stuff in that “review” pile we’ll decide we can live without. Thirty years ago, my Grandma went on a week-long binge to “get rid of all the junk” around her house, in her attic and basement. She lived in a small town where folks burned their trash and her incinerator burned for 7 days and 7 nights. After her passing, my Dad and his brother were faced with the job of cleaning out her house for the estate sale and were aghast when they went to the attic where precious family heirlooms had been stored for nearly 70 years only to find everything was gone. When Grandma said she was getting rid of all of the junk around her house, she wasn’t kidding. I might add, she was of sound mind, still working as an R.N. and fully aware of her decisions. I’m not suggesting any of us would be that drastic in our actions, but making changes, big changes requires time and thought. To that end, I love what you’ve done with your collections! 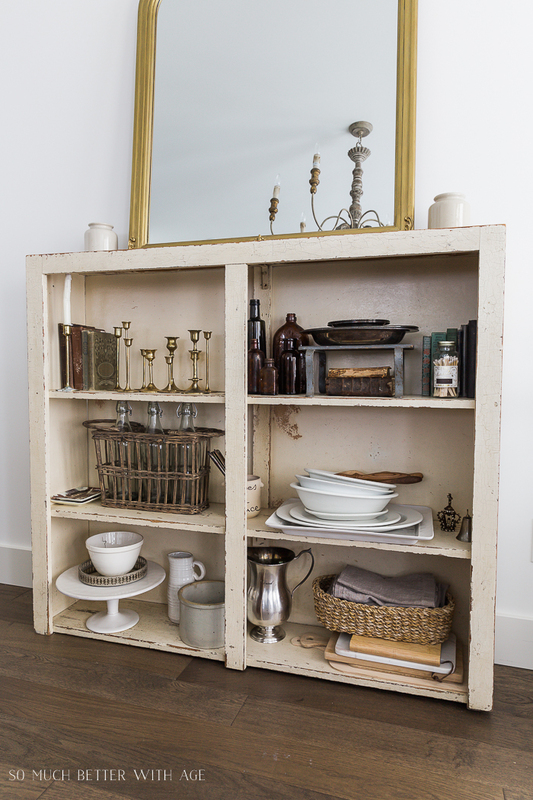 Your abandoned bookshelf is the perfect piece to display your lovely collectibles, it looks beautiful! The mirror atop the bookshelf is the finishing touch. Great advice! I just moved and am working my best to keep things I love… At some time, I will weed out more but for now… I’m hanging on to that stuff. Just for a while. Thanks for your response. Such great advice, Judy! I’ve been doing that without even realizing. 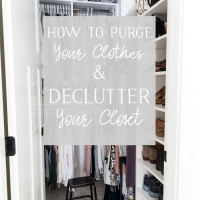 I’ve been slowly decluttering and purging since last summer and I think it does make a difference in making sure you’re actually purging what you mean to. I think it is all about balance and finding peace with yourself and your stuff when at home. Your shelf makes you happy and I am pretty sure Marie Kondo would approve of it! I bought your book and love your posts!! You hit the nail on the head with this one. My recent purge was inspired when my sweet teenage daughter accidentally flipped my antique wine table over while studying, breaking my huge confit pot filled with hydrangeas that had been there longer than I care to reveal. I tried so hard to glue it back but it will never be the same. So thus began my purge and redux of all my shelves and tired dried flower arrangements that I have been holding onto for so long. Now I have donated many items I tossed with one eye closed. I don’t want to burden my children when we are gone with all my “precious” things they really won’t want to keep. So I kept that in mind as I got rid of things. Yes I still have lots of china and pottery I am not willing to toss yet. But I did reorganize so I can easily find things I like to use when I entertain. That was my goal as well after digging through my messy cabinets over the holidays trying to hunt for that certain silver tray! One of your past posts inspired me to go hunt for old brass candlesticks and I love to use those all the time now. Instead of having to dig through my messy cabinets I keep them handy in a large drawer with all my candles and other tabletop candelabras. I wish I had a pretty place to display mine like you do. But this works and I can get to it very easily. That was my goal as I decluttered. I finally have organized and purged enough so I can find things more easily and it does make you feel much better and more likely to want to entertain more! Thank you for your inspirations. p.s. I confess I have not thrown out that cracked confit pot…yet! 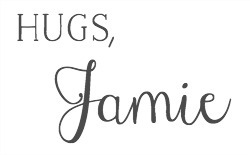 I love your sweet comment and it got me thinking…I don’t want to burden my children with extra stuff too. It takes me a few rounds to go through things too. Thanks for sharing! Sometimes it does take something like a broken confit pot to get the ball rolling. I do the same, groupings and collections… and I have a little bit too much stuff, always, so I box it up, maybe one or two boxes and put them in the basement… then when I get tired of the groupings and collections I get the boxes out and redo. It feels like shopping, but I don’t have to leave the house or spend money on things I’d just repurchase. When it’s in a cabinet or on shelves and well organized it doesn’t look like clutter to me… it looks interesting and unique. I like the word “curated”. I do the same, Aerial! But I have extra home decor on some shelving units in my basement. It does feel like shopping! Jaime…I am trying to become a minimalist but do find it hard to do….but I do like the idea of grouping it together….it is a work in progress. 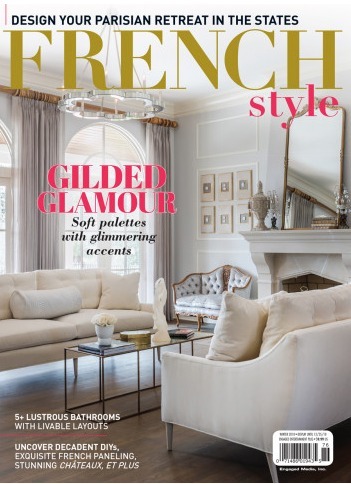 We are planning a trip to France next year so found your blog interesting also want to get your book….can I purchase at a store or do I have to order online? I hope you have a wonderful time in France. Let me know how your trip goes! I got your book as a Christmas present from my husband. I like your projects. 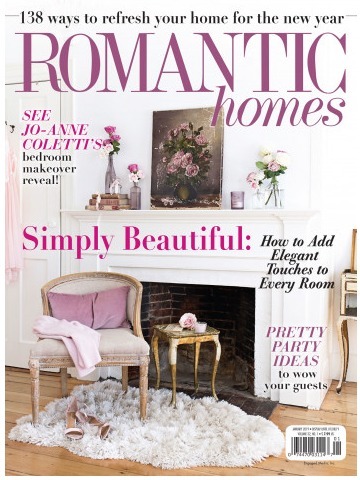 Your house looks so romantic. Minimalist? I think I am not ready. I like to be surrounded by the things I love. Well, from time to time, when I am tired of something, I I give away certain pieces. In that case, I allow my heart to be smitten with something else! I’m so glad you’re enjoying my book! I love a cozy home without too much clutter. It’s definitely a fine balance. Thanks for your sweet message. I adore the bookcase you recovered from your basement left~overs! that nearly met its demise, until I saw what it could become. I, too, have many collections. I don’t want to part with them, just yet. are working within my space. Trying not to store any ‘away’. 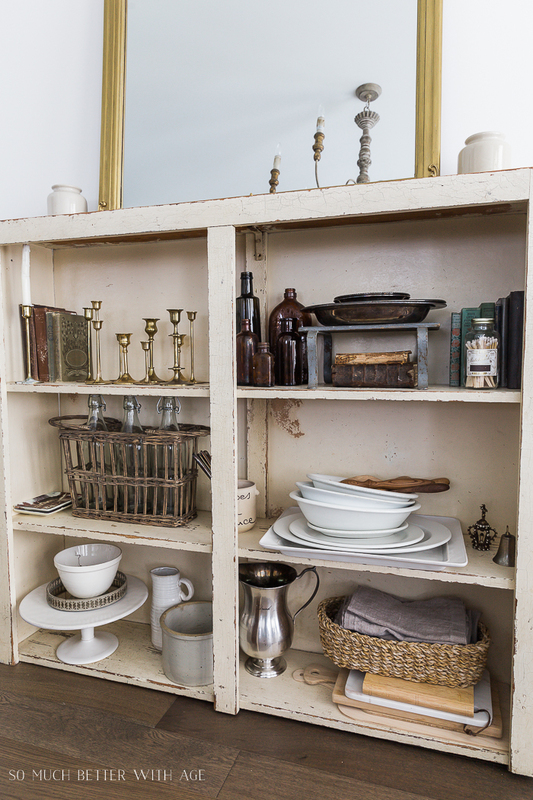 Love how you’ve grouped together ‘like’ items in your cabinet! Thanks so much, Pat. I nearly threw away that old cabinet too but once I brushed off all the cobwebs and took off the leftover paint, I realized how beautiful it is. I love that patina and it’s something that’s so hard to recreate. I love your ideas for not storing away what you love.